...inset, undermount, stainless steel, granite & ceramic. ...modern, traditional, kitchen & bathroom. ...laminate, solid surface, granite & solid timber. ...LED, halogen, low energy for all around the home. ...sockets, switches, TVs, radios & more. As a regional distributor we specialize in distribution to the North of England. Keep up to date with all the goings on in the kbb / appliance industry and here at HDL. Hibberd Distribution Ltd, based in Blackpool, specialize in the distribution of high quality, economically priced products to the kitchen industry with a regional distribution coverage across the North of England Humberside, Teeside, the North East, the Midlands, Deeside and North Wales. Our trade customer base includes Kitchen Retailers and Builders Merchants, with an emphasis on a specialist supply and install service specifically for the House Builder. A twice weekly delivery service is available to most conurbations, using our own fleet of vehicles, and in addition, an overnight carrier service at competitive rates can also be used for those urgent deliveries. 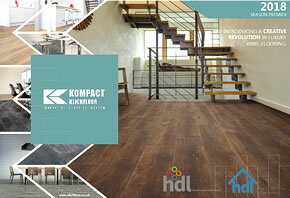 A luxury Vinyl KLICKFLOOR system that gives a perfect foundation on which to build stunning spaces. You can read more here. Caple has raised the bar with a new bank of appliances in the latest colour trend, Gunmetal. The must have built in appliances add a touch of elegance to the modern & contemporary home. 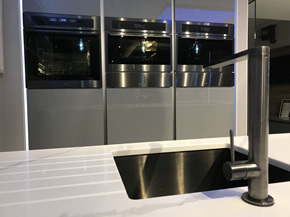 Featuring a sleek gunmetal aesthetic and topped with a highly protective PVD coating, these stunning appliances have a unique style all of their own. Included in the range is a pyro oven, soft close oven, microwave combi and a steam oven along with warming drawers to match. See the images attached showing the range in our showroom with the Mode sink and Karns tap, also in the gunmetal finish. 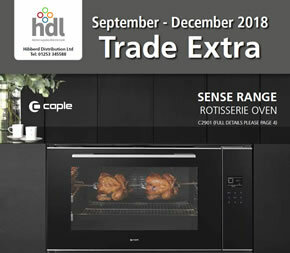 September Trade Extra Out NOW! September trade extra is now available, featuring the new 12mm Compact solid laminate worktops by Westag & Getalit. Contact the sales desk or speak to your ASM for your copy. Alternatively, it can be viewed here.